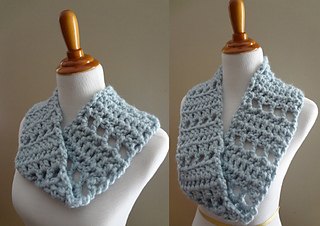 The Cloudy Sky Mobius Cowl is a bulky cowl with a twist…literally! 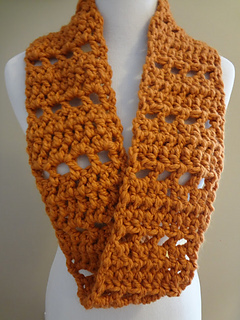 This cowl is chunky, lofty and warm, but also has the added advantage of laying perfectly flat because of the “mobius” or twist made before seaming it together. This is the perfect project for those who like to be toasty without any unnecessary bulk. 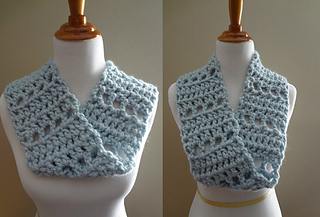 It is the perfect companion for a v-neck coat (like a pea coat) too. Instructions are provided in two different sizes as shown above, a shorter version and a longer version. 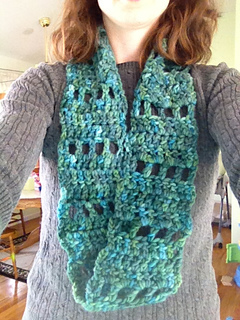 Cowl is crocheted flat, then twisted and seamed.